Emotional Freedom Technique For Dogs and Cats: 45 minute Video (MP4 format - Download). The Video is also available on DVD, shipped to your door - to order the Video on DVD, check the box below. Discount: Buy ANY 3 Videos and get 1 FREE! Order any 3 Videos (downloadable OR on DVD) from the Videos & DVD category, and add another video for FREE! Discount will be applied when more than 3 videos have been added to your cart. 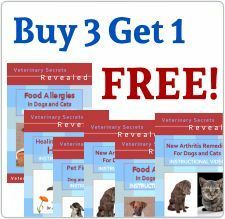 Emotional Freedom Technique For Dogs and Cats is a 25 minute DVD Video of Dr. Jones demonstrating and discussing how to use EFT to help your dog or cat. Basic price includes mp4 download only. To have it shipped to your door on DVD, simply check the box above (if you select DVD option, your order will include both the download as well as the DVD shipment).